There’s a lot to say about cheesecake but very little that’s really necessary. I was surprised to find this old fashioned cheesecake recipe in “The Art of Fine Baking.” It’s not one of my grandmothers well-known recipes and seemed a bit out of place amongst the fancy tortes and cakes. As summer approached, I decided I would try this basic recipe and top it with the fresh strawberries that are now in season and grown locally. My only issue was that the original recipe called for “Zwieback” crackers in the crust. I had no idea what these were and not only did they sound a bit ancient to me, I almost thought they were made up (my grandmother’s maiden name was Zweier, an unlikely coincidence). After a little research, I discovered that Zwieback crackers was a cracker toast often marketed by Gerber and Nabisco as a baby biscuit. It appears that these were discontinued about 4-5 years ago. There are a few homemade recipe versions available online but I opted to replace the Zwieback crackers with good old graham crackers. Since ground pecans or walnuts make up half the crust, the graham crackers don’t take away from the crust’s integrity. That unique rich nutty flavor still gives this old fashioned cheesecake that little special Paula Peck spin. Note: The baking instructions below have been modified from the original recipe. 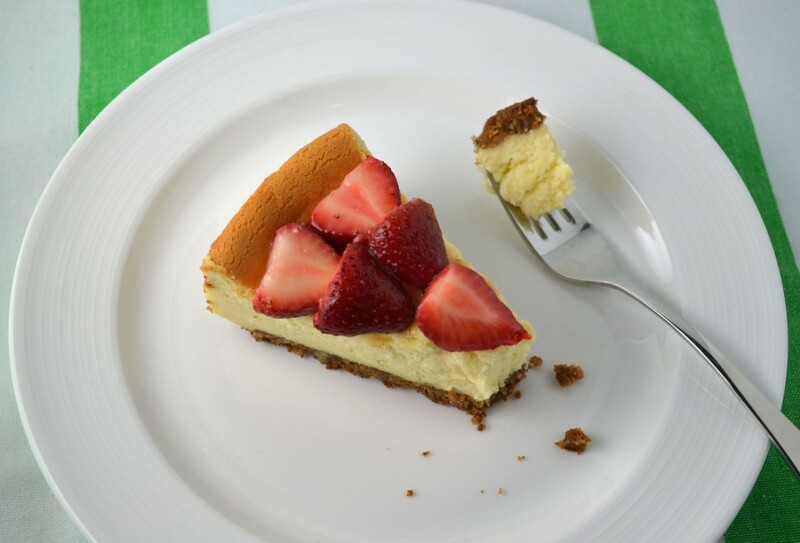 If a crack-free cheesecake is preferred, bake the cheesecake in a water bath which will allow it to bake more slowly. Simply place the spring-form pan in tin foil and ensure foil is folded up the sides (this protects the cake from any water that could leak through). Pour hot water around the foil lined cheesecake. Preheat oven to 325 degrees. Lightly grease the bottom and sides of a 9-inch spring-form pan. Combine graham cracker crumbs, grated nuts, melted butter, and 2 tablespoons sugar. Mix with fingertips until ingredients are blended. Spread the crumb mixture on the bottom of the spring-form pan. Press down firmly. Mix the cream cheese with half the remaining sugar, salt, vanilla, and lemon zest. Beat in egg yolks. Beat egg whites until they hold soft peaks. Add the remaining sugar a tablespoon at a time, beating well after each addition. Beat until very firm. Pour whipped cream on top of stiffly beaten egg whites. Add cream cheese mixture and sprinkle flour on top. Fold together gently. Pour in prepared pan and back for 45-60 minutes or until cheesecake is firm but still slightly jiggly in the center. Remove from oven and allow to cool 30-60 minutes before chilling fully in the refrigerator. While cheesecake is chilling, make strawberry topping by combining sugar with the strawberries. Cover and chill for at least 1 hour. Spoon strawberry topping over chilled cheesecake right before serving. This sounds very much like my Austrian-Czech grandmother”s recipe – I haven’t made it since my mother passed away 5 years ago so I didn’t know Zwieback is no longer available. I’ll have to try and find some in Vienna when I’m there in February. Thanks Megan – just discovered your blog through Edible Brooklyn’s Holiday Issue. I’m from Milwaukee but now live in New York. Thanks Kathryn – Since I wrote this post 1.5 years ago, I’ve seen Zwieback make somewhat of a come back. It’s still rare but I’ve seen the Brandt brand for sale again here in the US. I’m glad this brings back memories of your grandmother’s recipe. Thanks again for commenting!